The crural muscles is called to the group of muscles that help in the feet’s motion. It is separated into three groups namely: lateral, posterior and anterior. The leg’s anteromedial aspect lacks the muscles’ attachment sites. There are two muscles which make up the lateral crural muscles. These are the peroneus brevis and the peroneus longus. The peroneus brevis is close to the foot and bears a deeper muscle compared to the peroneus longus. Peroneus longus, on the other hand is a flat and long muscles that lie on the fibula. The ankle flexion only rely on the unified action of the peroneus brevis and the peroneus longus. In this groups, there are seven muscles which is to be grouped into two namely: the deep group and the superficial group. Muscles belonging to the deep group are the popliteus, flexor hallucis longus, the flexor digitorum longus and the tibialis posterior. The plantaris, soleus, and the gastrocnemius muscles belong to the superficial group. The popliteal muscle on the other hand, is a part of the foot that is situated deep within the gastrocnemius heads. This part is intended to assist the movement necessary in the foot, but is limited to the knee joint’s rotation. The bi-pennate flexor hallucis longus muscle is located in the leg’s posterolateral side. The muscles in this part of the foot, flexes the hallus’ joints, and it also provides assistance to the foot inversion and the plantar flexion. The flexor digitorium longus muscle is located in the hallucis longus muscle’s parallel side, or on the leg’s middle portion. The distal tendon in this part is very important to the other parts and is greatly involved in the motion of the foot, particularly the malleolus until the foot’s plantar region. From there, it extends in four various directions, reaching out to several number of joints. Some of the few movements of the foot aided by this part are: foot inversion and toe flexing. This part of the muscle is for the plantar flexion of the foor and its arch support, and the foot inversion. The tibialis posterior also has an active distal tendon which passes posteriorly and medially in the malleolus. It also is situated continuously within the cuneiform’s plantar surface, the cuboid bones and the navicular. From that point, it is continuous until the second, third and fourth metatarsal bones. 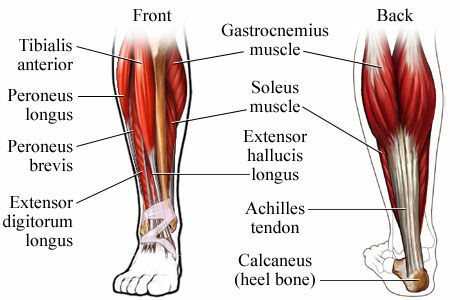 The muscle located in the calf and its superficial muscle is created by the the gastrocnemius. Aside from that, it is the gastrocnemius which holds the knee joints’ flexions and the foot’s plantar flexion. Its point of origin is located in the lateral and medial posterior sections of the femur’s epicondyles. The tendo calcaneus, or popularly known as the Achilles tendon inserts and holds the muscle to the calcaneus. This part of the foot is the strongest tendon in the body- it is the reason why it is named after Achilles, the invulnerable man in famous Greek mythology. This tendon is not prone to destruction, and is the most commonly worn out part in any athletic or sporty activities. In that tendon also lies the soleus, a deep muscle. It is considered as one muscle with the gastrocnemius muscle, and it is known in the name triceps surae. The soleus is capable of making up the foot’s plantar flexion passing through the ankle joint. The plantaris muscle is located inferiorly to the gastrocnemius muscle’s head and begins on the femur’s lateral ridge. The insertion point of the plantaris muscle is the calcaneus, however, it is conjoined with a smaller and slimmer tendon. This part provides flexion and plantar flexion for the knees and ankle respectively. This part is very vulnerable and it is also labeled to be the a useless muscle. There are four muscles which make up the anterior crural muscles namely: peroneus tertius, tibialis anterior, extensor digitorum longus and the extensor hallucis longus. The tibialis’ manual palpation takes place within the tibia’s lateral segment. Situated in the tibialis’ lateral part is the extensor digitorum longus, and between this musclea and the tibialis anterior is the extensor hallucis longus. Peroneus tertius muscle on the other hand, is located after the extensor hallucis longus.